Living in the hectic city environs of Chicago, Pam and Todd Eveland searched for the perfect spot to build their getaway place. 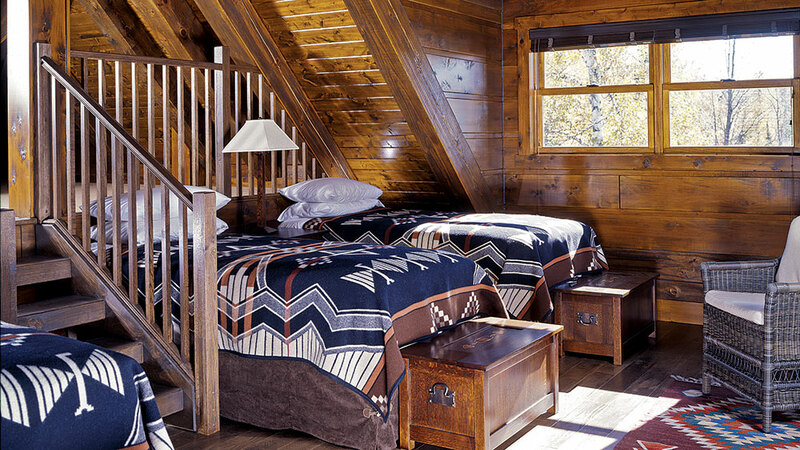 “We love our privacy and wanted a secluded rustic camp retreat,” says Pam. A bit farther afield than expected, the couple found a 10-acre parcel on Big Maggie Lake in Michigan’s Upper Peninsula. “It takes about five hours to drive there now that the roads have improved,” says Pam. Although it’s a long commute, the drive is worth it—the pristine, “no-wake” lake is surrounded by northern hardwood forest with no other houses in sight. Their parcel, a long, narrow ridge that juts into the lake, made an ideal place to build their dream home. With the design requirements in place, Gauld started elevations on a heavy timber post-and-beam structure with detailing in the Arts and Crafts style. The inspiration for the design was an early childhood memory of a lake house on Little Lake Sebago in Maine that had been in his family for a couple of generations. “It was known affectionately as ‘The Camp’ and was a place where the extended Gauld family would gather,” he says. “I wanted to re-create this feeling in the Eveland Camp — to conjure a casual charm using rustic materials … with places where children could fall asleep listening to grown-ups in conversation.” One of Gauld’s greatest challenges in the design was conforming the footprint to the long narrow lot. He treated the design almost like a ship, creating a large hipped-roof screened porch for the “bow,” which fronts the lake. “When sitting on the porch you feel like you are on a boat right on the water — one of the great advantages to the lot is its unobstructed lake views from three sides of the house,” he adds. “The house is surrounded by water.” The 2,500-square-foot timber frame structure is 25 feet wide and 67 feet long. The ground level consists of the screened porch, a living room, a dining area, a kitchen, a master bedroom, and a bath. An open sleeping loft overlooks the main living area. A second loft — just five steps up from the main loft—was meant for storage, but when the homeowners saw the beautiful exposed beams they decided to keep that small loft open as well. “It has become a great play area for children,” Pam says. The basement level includes an entry hall, bedroom, full bath, sauna, mechanical room, and two-car garage. Todd and Pam hired John Nieminen, owner of Cooks Run Cedar in Michigan, to build the custom design. The company also custom milled the building materials — the exterior siding, framing beams, interior wall paneling and trimwork. The exterior siding system, developed by Nieminen is called Chink Loc. A tongue-and-groove 10-inch wide Northern White cedar board and a thinner 1 1/2-inch cedar board alternate to create the wall. The layered effect resembles the chinking on a log cabin. The wall treatment is replicated in the interiors, using the same board dimensions and materials. Gauld specified a dark stain for both the interior and exterior to give the look of a rich walnut. The deep color calls to mind old boards that gracefully aged over the years, creating a warm patina. Gauld added another interesting texture to the structure by incorporating clinker brick into the foundation. The “clinkers” are hard-burnt bricks distorted through overfiring, making them highly distinctive and nearly water resistant. Noted 20th-century architectural firm Greene and Greene used clinker bricks in the designs of many of its the Arts and Crafts style houses in Pasadena, California. 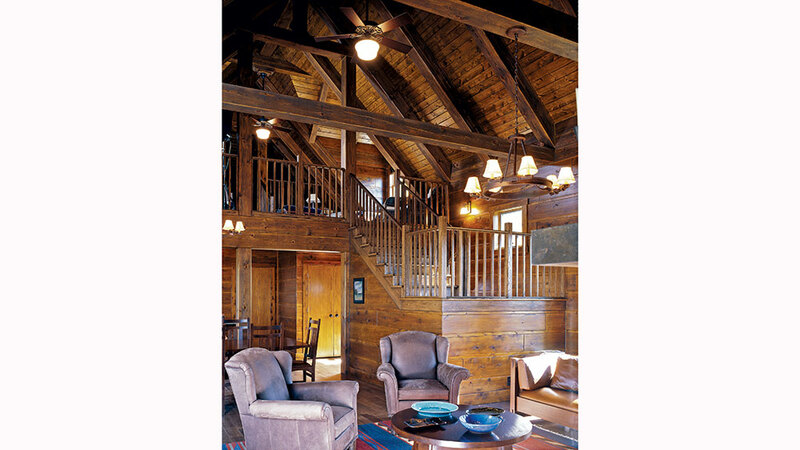 The interior is pure Arts and Crafts inspiration — rich-toned exposed beams and roof joists, horizontal wallboard, and simple, linear door and window trim — that creates a handsome, natural living environment. A soaring 23-foot high fieldstone fireplace made from Lake Superior Granite is the focal point in the living room. Gauld also acted as interior designer. 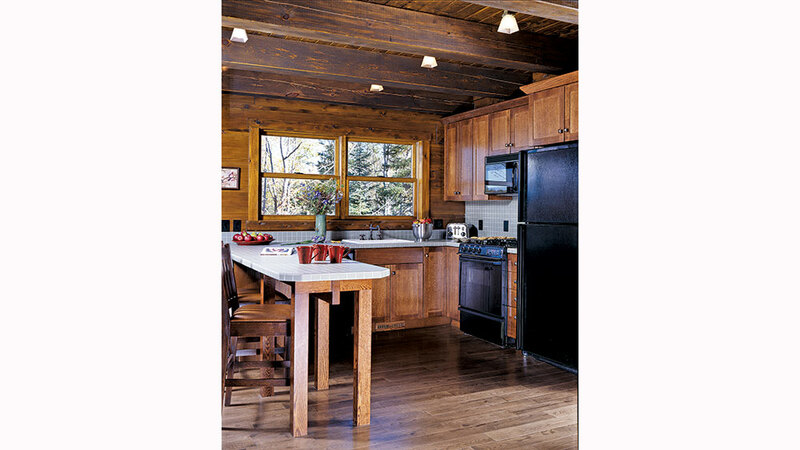 He selected lighting and hardware for the camp, including Craftsman-style pendants and chandeliers and Baldwin’s Estate Hardware with an oil-rubbed bronze finish. The furnishings also are in the Craftsman style, such as the Stickley sofa, dining set, beds, side tables, and chairs. 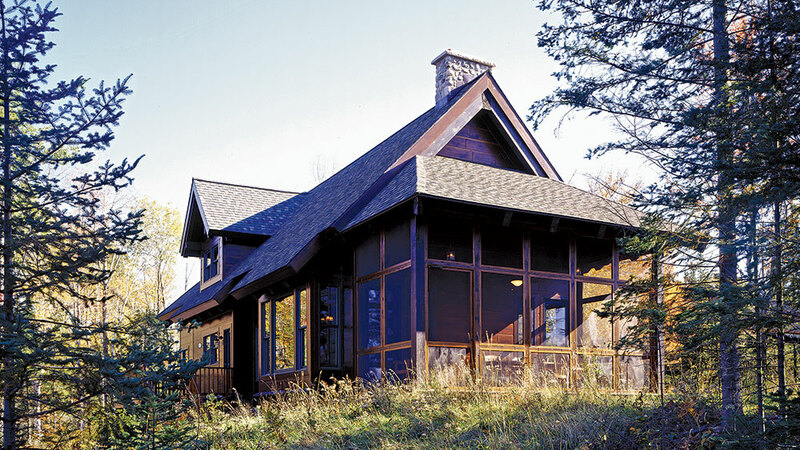 With the tenets of the Arts and Crafts movement — “Have nothing in your house that you do not believe to be useful or believe to be beautiful” — securely wrapped into the design of the home, Gauld has captured the essence of a true getaway place made with integrity and permanence for future generations to enjoy. The great room fireplace reaches 23 feet high and is made of Lake Superior Granite. A simple wood mantel mirrors the structural tie beam running across the chimney. The support posts create a natural break for the staircase to the light-filled loft, says architect David Gauld. They are on either side of the entrance to the kitchen through the dining room. The kitchen cabinets are also in the Arts and Crafts style with square “hammered” knobs. Oak flooring is found throughout the house, including the kitchen. The tile countertops and back-splash are by Daltile. The architect created a sleeping loft overlooking the living room. A staircase with a simple square newel post and balusters leads to a second mini loft for children to play. The Chink Loc wall treatment is carried to the loft to create unity throughout the camp’s interior design. 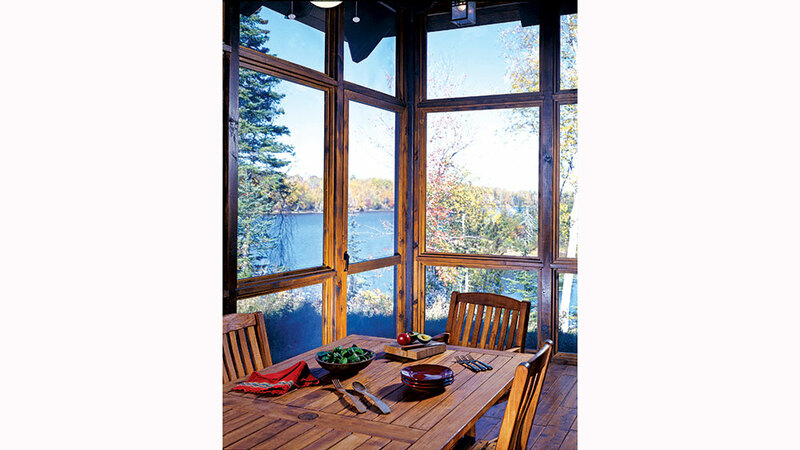 The screened porch provides an unimpeded view of Big Maggie Lake. The Evelands enjoy many activities at their lake house—skiing, swimming, hiking, kayaking—but most of all, they enjoy the peace and quiet at their retreat.